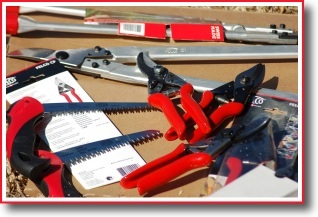 In June 2012, a donation was made of FELCO gardening equipment. Thank-you Laurent Perrin-Flisch of FELCO Switzerland for your support of the project and to Leon and Gys Liebenberg, FELCO representatives in South Africa, for making the necessary arrangements for delivery. A number of premium quality cutters, pruning saws and long handled gardening sheers were received and couriered to the Kunavelela Project. Good luck to all of you who are involved with the project!